West end locations for summer camps have now been added to the program list. If you know of anyone looking for summer sports camps in the west end of Ottawa, check out our SummerFun Camp page. This camp will introduce youth to the fundamentals of volleyball in a fun and positive environment. Athletes will learn the basics of volleyball using special equipment. More advanced players will be teamed up and challenged! Club and School athletes welcome! This program enables young athletes to learn and develop essential volleyball skills and develop at their own pace. 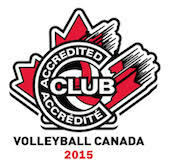 Five days of fast-paced and intense volleyball to help athletes refine their skills. Special focus on: hitting, digging and strategic playing! Feeling too old for camp but want to stay active and involved? Apply as a volunteer assistant and help more young people learn to love the great sport of volleyball. This is a good way to gain valuable work experience.